Our team has crafted BizTalk Server training courses that are broken down by both job role and skill level. We offer courses for both BizTalk Server Developers (those writing code and building out integration solutions), and BizTalk Server Administrators (those setting up and optimizing the BizTalk Server environment and monitoring applications running on top of that environment). Fundamentals - Our self-paced Fundamentals courses offer the equivalent of 2 days' worth of training content that provides a base level understanding of BizTalk Server. Immersion - Our live instructor-led Immersion courses offer 5 full days of training content that expands beyond the Fundamentals offerings. Either one of these can serve as your starting point in your journey with BizTalk Server. 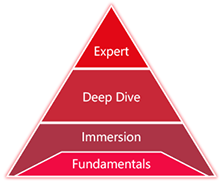 Deep Dive - Once you're ready to take it to the next level, our 5-day live instructor-led Deep Dive courses can provide you with a more focused and deeper look at the technology. Whereas the Immersion courses demonstrate how to do things, the Deep Dive courses will help you understand why you do certain things. Expert Series - Our 2-3 day live instructor-led Expert Series courses go even further, but not as broadly, as they each focus on the full details of one specific piece of BizTalk Server. Your BizTalk installation is a big investment, and you need to be confident not only that you understand how the technology works, but also that it is optimized for your mission-critical business processes. Learn to develop and manage BizTalk Server solutions with QuickLearn's accelerated BizTalk Server training today. To get started, select a course from the listing below. Learn how to develop applications for BizTalk Server in one of our courses for new and experienced BizTalk Server developers. Learn to manage and deploy applications for BizTalk Server in one of our courses for new and experienced BizTalk Server administrators. Learn to develop advanced BizTalk Solutions in one of our courses built exclusively for experienced BizTalk Server developers. These courses provide an advanced drill-down with extensive hands-on labs. Which Class Is Best For Me? If you are not sure whether you should choose Immersion or Deep Dive, we've got you covered. Our self-assessment exam can help you determine which class would be the best fit for you. An added value of every QuickLearn course is our free retake policy. Our accelerated courses are so content-rich that we invite students to come back within six months to pick up additional takeaways. Know Which Class You Need? Great! We offer a highly-available schedule of BizTalk classes. Our New to Product classes typically run every 4 weeks, and our Advanced classes usually run every 6 weeks. If you don't see a date that works for you, check out our schedule.